Here’s a pain: write an ASP.NET ExpressionBuilder. Here’s another: use a ValidationExpression for a RegularExpressionValidator which isn’t hard-coded, Resource based or App Settings based, but code based. This post will cover both pains, but will open a “world of options” for using custom ASP.NET Expressions. Assuming that you have a corresponding resource file, the user will see the value set there for the item that has the Description key. I won’t get into this in this post, but I’m a big fan of using Resources in ASP.NET, so Expressions are something I use often. ASP.NET comes with 3 out-of-the-box Expression “types”: Resources, Connection Strings and App Settings. Anyhow, if you do want to use a regular expression placed in a const, static field or a static property as written in the following code, you are now stuck, or you are forced to code-behind this in your page and give up the declarative ValidationExpression. Write a custom Expression class by inheriting from ExpressionBuilder (e.g. StaticExpression class that will accomplish retrieving static, const or Property values). This class should have a static method which actually performs what you want to do and return the desired string. This class should also implement the abstract GetCodeExpression( ) method, which simply uses CodeDom objects to call the method you created in step 2. (Note, that you may choose to implement the code directly from this method and skip the static method in step 2, as shown in MS’ sample). Add the custom Expression to the web.config, so that ASP.NET will now how to resolve the declarative Expressions in your pages. Lines 9-18 is the CodeDom method which returns the custom method which actually does all the work (lines 20-71). 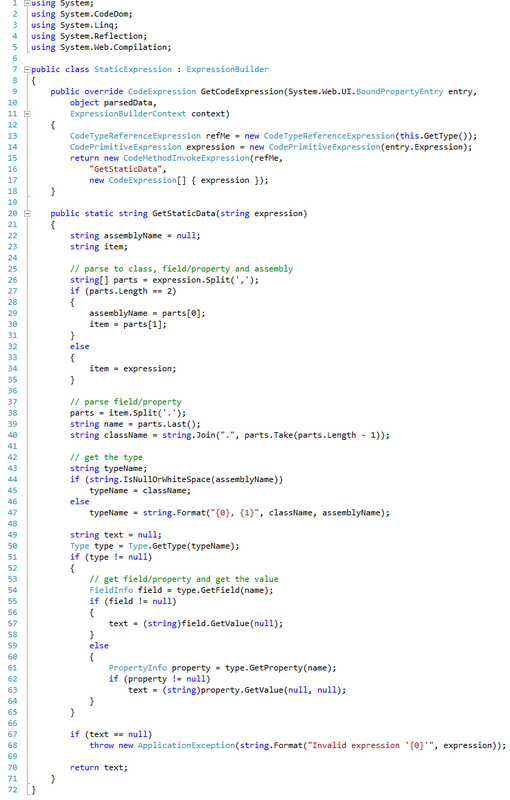 Lines 26-35 parse and determine whether the expression contains not only the class and field/property, but also an assembly name where to retrieve it from. Note, that you can alternatively change the code so that if no assembly is specified, some default assembly is used (in such a case you’ll have to insert a line of code adjacent to line 34, which states: assemblyName=”<your default assembly name>”. Lines 29-30 assumes that the expression specifies an assembly, and that the assembly is specified prior to the const/property. This resembles working with Global Resources, but this doesn’t have to be the case. You may choose to specify the assembly after the const/property name, resembling how Reflection’s Type.GetType work (line 47 shows this). Lines 38-47 resolves the type of the class to be used. The expression, without the assembly, is parsed so that we’ll have the class (including namespace if specified) separated from the field/property name. Line 50 retrieves the actual class type. Lines 54-58 attempt to detect if the name relates to a static field or const, and retrieve it’s value (the null in Line 57 implies a static field or a const). Lines 59-64 relate to properties (the first null in Line 63 implies a static property and the second null means that there are no arguments to this property). Lines 67-68 will throw an exception if the text could not be retrieved. The Label’s Text demonstrates how to retrieve MyConst const from a Consts class residing in the App_Code (no assembly specified). The RegularExpressionValidator’s ValidationExpression demonstrates how to retrieve a static Property value from a class residing in a different assembly. You may also choose to inherit ResourceExpressionBuilder instead of the abstract ExpressionBuilder. This could be handy if you need a custom Expression that will fallback to resolving a Resource Expression. For example, if your page is running in two different custom modes, X and Y, you could change the resource key stated in the declarative property and only then proceed to retrieving the resource, by calling the base class methods. Your code will require changes, but it’s certainly achievable.